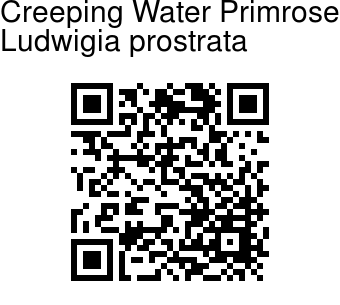 Creeping Water Primrose is a semi-aquatic annual herb up to 2 ft tall, often red tinged, with branchlets angled and slightly winged. Leaves are 3-10 x 0.6-3.6 cm, elliptic to lanceshaped, base narrowed, slightly decurrent, tip pointed or tapering, brownish on drying; lateral nerves 8-13 pairs, leaf-stalk up to 1 cm long. Flowers are 5-7 mm across, in the upper leaf axils, borne singly or in clusters of 2-10 together, nearly stalkless. Sepals are 4, 2-2.5 x 1-1.5 mm, ovate-lanceshaped, margin fringed with hairs, tip pointed, persistent. Petals are yellow, 2-3 x 1-1.5 mm, inverted-lanceshaped or narrowly spoon-shaped, base wedge-shaped, tip pointed, 1-nerved. Stamens are 4, about 1 mm. Capsules are 1.2-2 x 0.1-0.15 cm, linear, curved, 4-angled, pale brown, hairy or hairless. 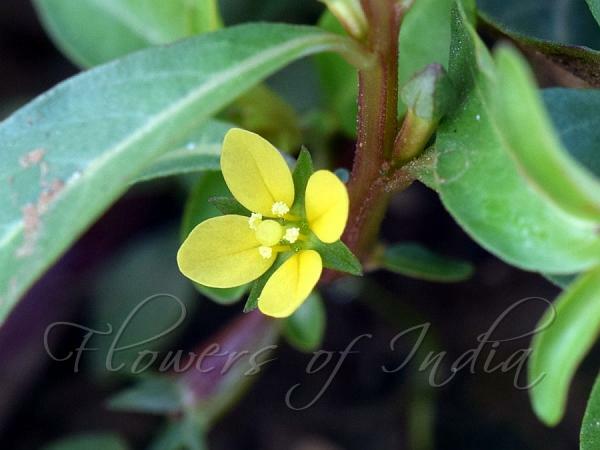 Creeping Water Primrose is found in India, China, Sri Lanka and SE Asia.